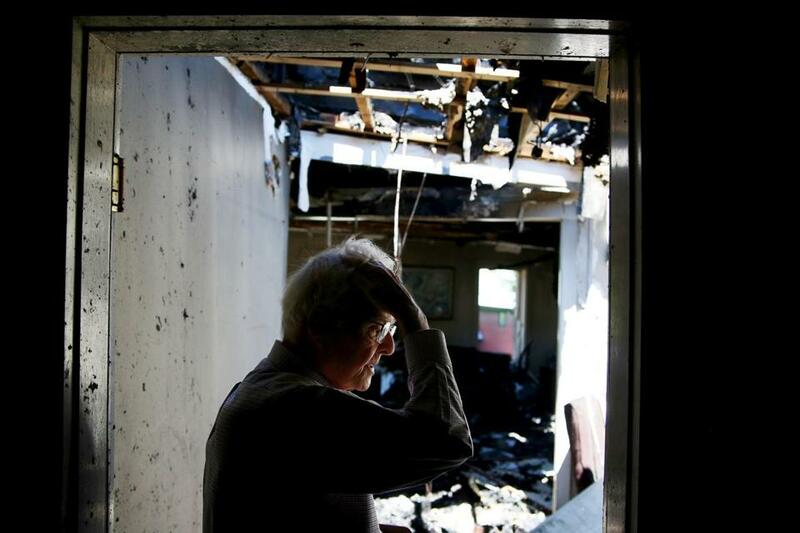 Phillip Camp, owner of the Vermont Standard, surveyed the damage at the newspaper’s office, which was devastated by fire on Monday. WOODSTOCK, Vt. — In the smoky chaos of the fire that devastated the offices of the Vermont Standard on Monday, two things quickly became apparent: This historic town would rally around its newspaper, and the paper would go to press this week, as it had each week for 165 years. As firefighters fought the blaze, editors asked them if they could save just two computers — the main server and the graphics computer. They could make do with just those. They got all 12. Residents started a relay, taking computers from firefighters and handing them down the line to a safe location. At Soulfully Good Cafe, co-owner Vicki Ferentinos saw the fire trucks when she arrived at work and immediately started baking. Throughout the day, she brought six full bags of homemade pastries and artisanal sandwiches to give out at the scene. Then there was the staff of the Norman Williams Public Library, which quickly offered the newspaper work space to get out this week’s edition. At a time when many newspapers are struggling to survive, Woodstock’s support of the Standard was a reminder that community papers in some areas remain viable. 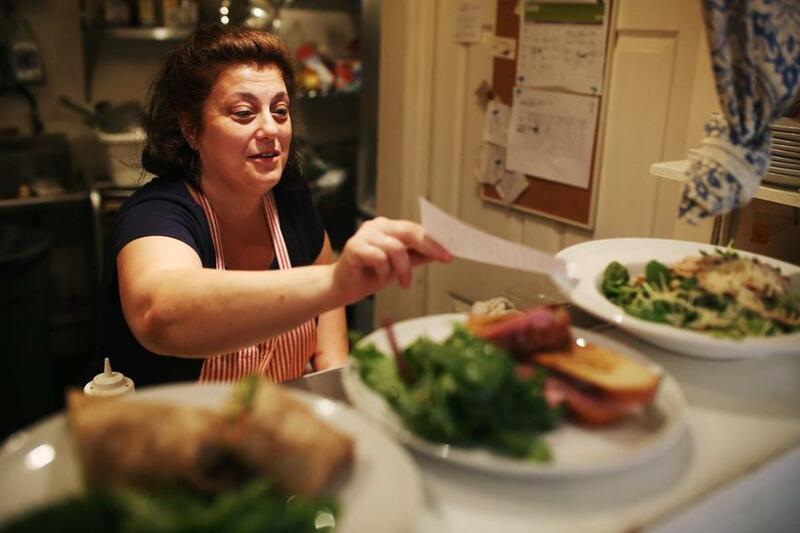 Soulfully Good Cafe co-owner Vicki Ferentinos brought six full bags of homemade pastries and artisanal sandwiches to give out at the scene of Monday’s fire. The fire, which authorities consider suspicious, apparently started in a pizza restaurant on the first floor of the Central Street building that the newspaper shares with three apartments and an art gallery. On Thursday, State Police and fire marshals had set up across the road from the blackened building. A dog trained to identify accelerants drew officers’ attention to several places in the pizzeria that merited further testing, although no conclusions were announced. Down the street a little after noon, the top floor of the library was buzzing. The Standard’s 10 full-time staffers, many who have worked for the paper for decades, worked feverishly in their borrowed carrels. They needed to get all four sections of the paper to the printer by 1 p.m. to make their deadline to publish Friday. 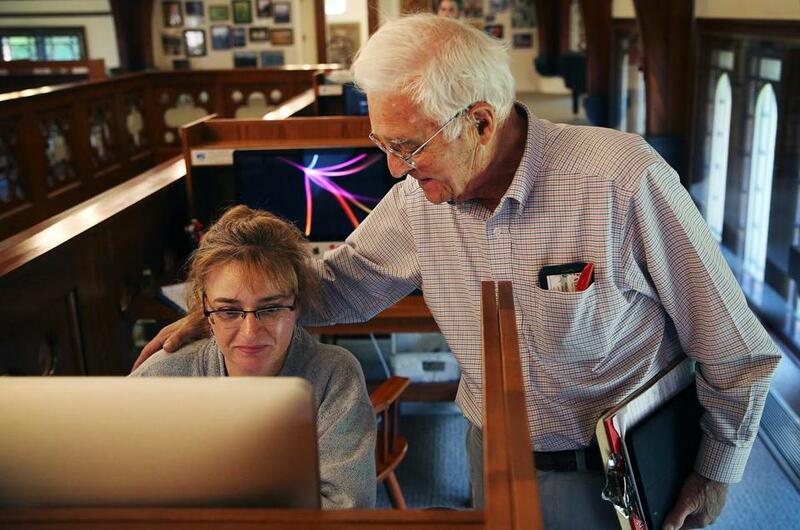 “We go to press in half an hour, you bet your sweet life!” announced Phillip Camp, 82, who has been president and owner of the newspaper for 38 years. The Standard distributes over 5,000 copies every week, and says that over half of all households in the surrounding area subscribe. A recent issue covered new Americans taking citizenship oaths on July 4 and a farmers market, among other news. It was not the first time disaster had struck the paper. In 2011, flooding from Tropical Storm Irene dumped more than six feet of water into their old building. They published a paper that week, too. Phillip Camp, president of The Vermont Standard, thanked Production Manager Lisa Wright for her hard work. Mary Reilly, longtime Town Hall employee in Woodstock, Vt.
Camp’s voice grew husky when he spoke about the generosity of his town, and of the need to persevere. Staff members recalled that the day after Irene struck, business manager Jean Maynes walked into the room smiling. “Guess who’s getting paid today?” she asked. She held warped, muddied checks that she had found in a box that had sat buried under a foot of silt. She had peeled the checks apart and laid them on a picnic table to dry in the summer sun. On Thursday, she again went to the bank to pay the staff on time. In her 28 years at the Standard, she said, she has never failed to make pay day. And to Camp’s knowledge, the fire and the flood are the only two times in the paper’s history that it has ever missed deadline. Such a desire to soldier on, come what may, resonates in the picturesque town in the middle of Vermont, with its classic village green, gracious inns, and covered bridges. As fire inspectors worked downstairs, Camp and the newspaper’s general manager, Jon Estey, walked upstairs into the historic building. Some of the Standard’s offices, on the second floor, were smoky but intact, protected by thick, stone walls. Water still stood in the cooler; family photographs still smiled from the cubicles. On the other side of the wall, though, Camp’s office was incinerated. The fire had consumed the plaque from the New England Newspaper & Press Association that the paper won in 2016 as the region’s best weekly. Insulation from the ceiling lay draped over the arm of Camp’s desk chair like a suit jacket after a meeting. From the darkened intact offices in the stone section of the building, Estey chuckled.